Photos were taken in Chinhae, South Korea last year. We definitely miss the park that we used to visit. Please click the photos to see the enlarged beauty! Kha and the author of Simple Thoughts gave me this award, thanks a lot sis. 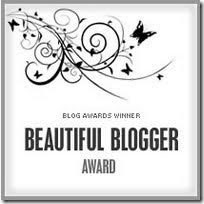 But wait, this is called a Beautiful Blogger award, Am I one? As a requirement I have to list 7 things about me. I prefer fish more than meat. I like working out but a little lazy these days lol. I am sharing this to the following beautiful bloggers Shy Bakla, Dhemz, Nuts, Tita Beng, Sheng, Jac, Seiko, Clang, Cacai, Maria, Liz, Ate Ces, Leah, Ibyang, Lulu, Kate, Bams, Anne, AC, Kero, Marice, Golden, A.Marie, Ate Lita, Anney, Chris, Khim, Kathy, Ate Eden, Ate Weng, Tokaya, and YOU who is reading this. This is mostly the scene you will see around our neighborhood. Every time I let Champ outside, I am scared that one of these icicles will fall and hit our dog. My husband took these photos when we had our doctor's appointment. I would like to greet my husband a happy happy birthday today! He would be tickled if you can head over to his blog and greet him. My daughter and I made a scallop potatoes yesterday and we designed a theme for Valentine's day. We have one big sweet potato and carved hearts shaped from it and that was what we used on top of the regular potatoes. We had so much fun while we were preparing it. What do you regularly put on your scallop potatoes aside from adding milk and butter? We added some ham and onions in ours. The sweet pototoes also give it a little twist. He gave me a ring..
A fruit ring hehehe. Am sure I got you with my title lol. I am just kidding, we love this cutie oranges fruits from California and we always have two baskets of these in the table. Usually it last for days and we need to get another batch again. We all love it because they are sweet and it is a must in this kind of weather so we won't have colds hehehe. So what do you think of my fruity ring? We had another big snow fall last night and still snowing real fine today. I wonder when is this going to stop. I am just glad that hubby's classes today were cancelled. When you go outside, all you see is white all over. I took these photos when we visited Dad the other night. Right now, our temperature is 14 degrees. The kids want to go visit my FIL but let us see if the road is not bad. Can anyone answer this "When will the resting ancestor toe the line on top of the killer?" My husband's classes was suspended yesterday so we got the chance to eat together a pinoy breakfast on Monday. My daughter and husband love tinapa (smoked fish) as much as I do so I cooked the last pack that we bought from the asian store in PA. We might come there again when the budget permits hehehe. We usually spend 160 to 200 bucks over there because we like to buy a lot of things since it is far from us.But anyhow, here's some snapshots after we eat. I usually eats last because I have to remove the bone of their tinapa because they don't know how lol. There you go friends, our version of pinoy breakfast. I am sure that most of you guys received junk mails in your email's inbox. Now my questions is do you get paid for it? I bet most of you just delete it right away because it is annoying to receive many of those everyday. The thing is you can get some thing out of those email ads. Turn those junks into cash by signing up to websites like inboxdollars.com or sendearnings.com. It isn't much but it does help in having a little extra cushion to your budget. All you have to do is read their email ads and you will get pai for it. If you like shopping, you can shop through them and then you get percentage back of what you spend.There are lots of ways to earn extra cash online, you just have to look for it. I received my check from the two above mentioned website today and I deposited it to our savings account. We also received Rylie's winning smile certificate from PinoySmile.com. Thanks Christine and thanks again to all of you who voted for my daughter on the said contest last October. We received the cash token last year and put it in her savings account. I totally miscalculate our expenses last month. I overlooked my due dates over in the Philippines such as my SSS and pagibig contribution, my sister's tuition fee and board and lodging payments, and my mother's needs. Wahhh, it is so hard to budget. Good thing we have a little save in our savings at the bank so we withdrew and send it. We tried xoom.com but its services is not available in our state, so we tried sending it through luckymoney.com. It went though but then we learned that it will take a week before the recipient could get the money and they were asking us so many requirements that disappoints us so we cancelled the transaction. The problem was, it took two weeks before the money was refunded. Gosh, I was like in a panic. Finally, we sent it though Moneygram in Walmart and it was cheaper and quicker. We used to send through western union but then the fee is sky rocket high so we decided to just change although I have points to redeem at western union as a gold card member. Oh brother, it is hard when you have lots of responsibility but what can you do but pray always that everything will be just fine. My husband is a medically inclined person, which explains why he pursued a degree a nuclear medicine for his follow-on career after retirement from the military. The thing that I enjoy most about his course major is that he shares a great deal of his knowledge with me. I think it will be nice having a medical professional around the house, especially when the kids fall and get hurt because he will be better able to assess their injuries. Every time our kids get hurt or fall, he immediately checks them for signs of a concussion. He said that brain injury is one of the worst possible things that can happen to a human being due the affects it has on the body and the high level of expertise that is often required to correct it. John's brother passed away a few years ago as a result of a brain injury. While navigating the stairs one night, he fell and struck his head. His injury caused internal bleeding which caused swelling on the brain which led to his death. The scary thing about brain injuries is that often times they go undetected until it is too late. According to the Brain Injury Association of West Virginia, our state has approximately 700 deaths each year as a result of traumatic brain injury. Most of these deaths occur at the time of the injury or within two hours of hospitalization. Those which are fortunate enough to survive will most likely suffer from long term disabilities. I feel that through proper awareness and training, organizations like this will be able to reduce these numbers over time and provide immediate assistant to families that are affected by this type of tragedy. How come as soon as February kicks in, everybody seems to feel that love is surrounding them? It seems that the aura of people that surrounds us are expressing their love for someone or feel so loved. Even our four year old little princess has been busy preparing valentine's card for her friends, aunts, cousins, her Pap, and for us. She drew this one last week and said that if ever people will turn into some other type of living things, the three of us will be butterflies. Each butterfly represent me, her and her brother. She used recycled materials such as her Dad's used printed material and the empty box of chocolates. The only thing we bought is the red paper which I help cutting into hearts. The theme for this week at Mommy Moments is Love language. Some people say that it doesn't matter if you say "I love you" or not as long as you show it in your actions. I agree in some sort but for me, expressing your love in words sill makes a difference. The love that we have for our kids can be expressed in many ways and in different occasions or scenarios. It is important that we let them feel and know how much we love and care for them. Love and affection cannot be filled by material things but with TLC from your heart. Okidoci folks, I gotta go to bed now because we have a dental appointment tomorrow. Thank you for taking time to visit my entry, I'll be visiting you tomorrow afternoon. I miss the chicken adobado that my father used to cook when I was growing up. Of course his version of it is better because he uses a native chicken that we use to raise. I tried making it the other day with the available ingredients I have. chicken wings or breast or you can use one whole chicken and chop it up. Just boil the coconut milk together with onion, garlic, chicken, and lemon grass, stirring it occasionally so that the coco milk won't get lump. If the chicken meat is tender, that's when you put the papaya and let it cook. You can serve it with rice when it's done. Ahhh tasted so good. If the Thai have chicken curry, my version is chicken adobado. YUM! My kids and I shared the same passion when it comes to watermelon. We all love it except my husband. But you know what, even if he is not fond of eating it, he buys it for us. That is how loving my super duper ex-boyfriend is. Thanks hon! So here we go, we cut it in half, we didn't slice it instead I just fed them because I did not want them to get messy lol.